All of our courses have been approved by the Idaho Department of Building Safety to help you meet your continuing education needs. Take the continuing education to renew your ID plumber's license today. All of our courses can be completed At Your Pace Online to help you meet the state's requirements to maintain your license. Once you finish your class you will have an official certificate of completion to save for your records, and we will report your course completion to the state for you. Journeyman and Contractors are required to obtain continuing education every three years. Journeymen need to complete 8 hours of continuing education, 4 hours of which must be on Code updates while the remaining 4 hours may be on industry-related topics. Plumbing Contractors are required to obtain 16 hours of continuing education. Hours obtained to renew a Journeyman license can be applied to a contractor's license when applicable. This eight hour course meets the continuing education requirements for Journeyman Plumbers and 8 of the 16 hours needed for Plumber Contractor's, under the requirements of the Idaho State Plumbing Code and the state of Idaho Division of Building Safety. We?ll review professional, educational, and background standards for plumbers, to better understand the other sections that follow. The classes rely on standards, recommendations, and codes developed on the national level, by the foremost experts on rainwater harvesting systems. 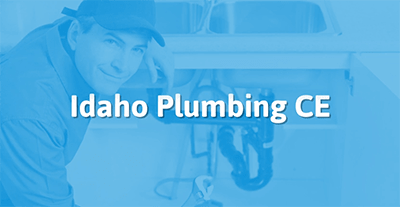 General principles, specific applications, and exploration of the relevant codes and laws provide a thorough grounding to plumbing contractors and plumbers in Idaho. This 4 hour course meets a portion of your industry related credits to renew a Journeyman Plumber or Plumbing Contractor license. The class relies on standards, recommendations, and codes developed on the national level, by the foremost experts on workplace safety for plumbers.